Researchers now believe ‘that the synchrony of the crowd might not be a root cause but instead acts as a feedback effect that amplifies pre-existing small-scale wobbles’, but leave open the question of how or why the swaying starts. So to date any such resonance seems to be largely a matter of luck – or bad luck, which ideally is where testing comes in. Some bridges could really put a swing in your step, says Science News. When a bridge — typically a suspension bridge — is loaded with strolling pedestrians, their gaits can sync, causing the structure to shimmy from side to side. The new study “allows us to better predict the crowd size at which significant wobbling can appear abruptly,” says mathematician Igor Belykh of Georgia State University in Atlanta. Engineers might eventually use the researchers’ results to avoid debacles like the one that befell the Millennium Bridge in London. This suspension bridge temporarily shut down just days after it opened in 2000 due to the large wobble that occurred when many people tromped across it at once (SN: 11/24/07, p. 331), necessitating costly repairs to fix the problem. Pedestrians crossing a bridge can cause slight sideways motion of the bridge as they push with their feet. This swaying may lead to the crowd unintentionally falling into lockstep because it’s easier to go with the flow of the swinging bridge than fight it. That synchronization, in turn, creates larger and larger oscillations. “It’s a dangerous phenomenon that could cause a bridge to collapse if it went unchecked,” says applied mathematician Daniel Abrams of Northwestern University in Evanston, Ill., who was not involved with the research. Continued here [includes video links]. To me it looks like inherent structural resonances (what they call ‘pre-existing small-scale wobbles’) of the bridge, and the slow synchronization of the people’s steps, working in concert that causes the problem. The noise of the footfalls gradually becoming tuned to the structures movement. To help stop the problem place disorganizing structures at irregular intervals that also damp the resonances of the bridge, e.g. coin slot operated telescopes for visitors to view the river, small kiosks selling candy, papers, pedestrian traffic calming barriers, etc. Alternatively stop making ugly symmetrical, unnatural linear structures, and start looking at the way nature has already elegantly solved many of these types of problems. When walking on moving surface underneath, the tendency is to syncronise the step to the sway, or a multiple of that (for boat deck). It is the feedback of foot sensation to brain that is in control. (Remember sailors in Beano swaying when on shore). This is a good one for a bouncy river crossing, only 1-2 persons needed. Nature has been building structure with minimum materials for maximum strength and resilience for at least a billion years longer than humans have been around. Take design ideas from nature apply imagination and stop building these problem structures. Nature would probably have applied phi, and perhaps structural periodic members at intervals, strengths, and lengths that fit the Fibonacci series. All very anti-resonant and usually quite beautiful. How bad was the shaking? This is nothing new, of course, but climate modellers have to pretend they’ve never heard of any such thing. If you admit that your castle is built on thixotropic mud then the funding may suddenly shear off. Yes OB, these things are known. Simple fractions are what designers use now! More elegant structures can be built that disperses those resonances out of harms way (out to high or lower frequencies), and be non-resonant at the step frequency, if such structural regularity (simple fractions) were reduced . Structures will have vibrational modes use nature’s ideas to keep them away from problem frequencies. Make the building with less linear stretches and with fewer simple fractions to parts, and fewer regular intervals between parts. Surely this is not rocket science. Of course the problem with the EU and other strong structures is that they’re uniformly brittle. Of course not, but worth repeating anyway. Harmonics everywhere. After extensive analysis by the engineers, the problem was fixed by the retrofitting of 37 fluid-viscous dampers (energy dissipating) to control horizontal movement and 52 tuned mass dampers (inertial) to control vertical movement. This took from May 2001 to January 2002 and cost £5M. After a period of testing, the bridge was successfully reopened on 22 February 2002. The bridge has not been subject to significant vibration since. In spite of the successful fix of the problem, the affectionate “wobbly bridge” epithet remains in common usage among Londoners. If you have a keen eye, you’ll notice an interesting sign posted at Albert Bridge. It says: “All Troops Must Break Step When Marching Over this Bridge”. According to engineering experts, the sign was the result of the fear that “mechanical resonance” created by the marching soldiers or a similar phenomenon might damage the bridge. Albert Bridge is the only Central London bridge never to have been replaced. The phenomena of forced harmonic excitation of bridge structures is well understood, and has been well documented by many sources. Most military manuals dating back well into the 1800’s have warnings about soldiers marching in stepover bridges of any type. This was true even for substantial bridges. For example, in 1860 the famous 1854 Roebling two-deck railway suspension bridge across the Niagara River at Niagara Falls, NY USA was posted with a warning notice to pedestrians against walking in-step. Indeed oldbrew, from what I recall of the opening of this Millennium bridge, the designers were more focused on moving the suspension system from the usual vertical mode to a horizontal mode than any worries about vibrations. Design a groundbreaking ( 🙂 ) bridge design as a celebration of the new millennium, and if we need to we’ll fix the practical problems later. 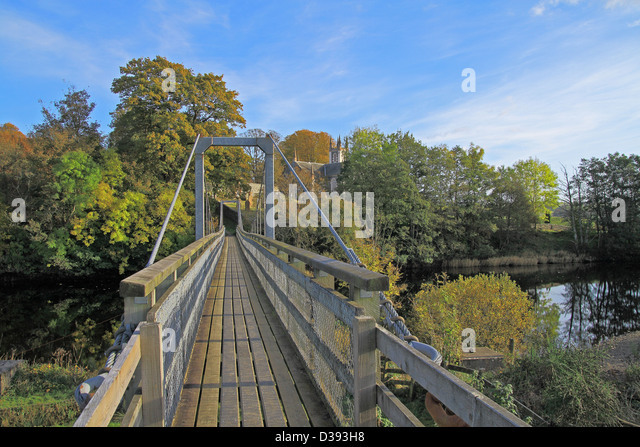 Design a robust, practical pedestrian bridge spanning the river — if it looks good that would be a bonus. 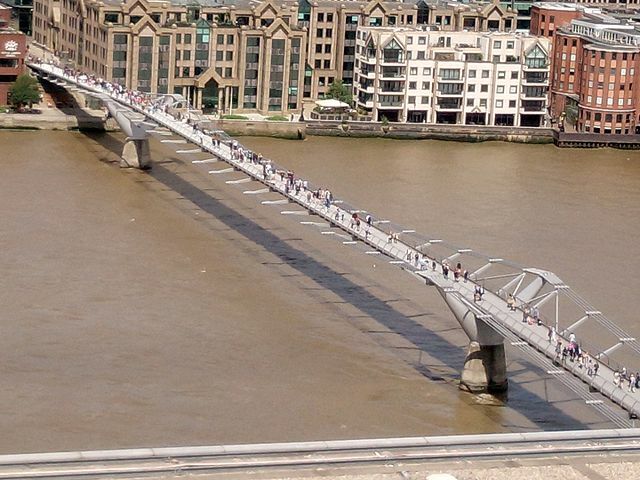 What was unique about the Millennium Bridge was that resonance was occurring without any expected forced motion or marching. Indeed, the pedestrian motion appeared to be purely random in nature. After extensive review of available video footage during the period the bridge was open, a series of tests were performed to study the observed pedestrian-induced motion. These identified a unique biodynamic feedback phenomena, later called “synchronous lateral footfall,” which resulted in seemingly random walking motions becoming synchronized over time among members of an unrelated group of people on the bridge. To address the various design issues, a unique and patented damper was proposed, previously used exclusively by NASA and other U.S. Government agencies for space based optical systems. With test safety being a critical issue, numerous rescue and police boats were stationed just downstream from the bridge in case of catastrophic problems…The Town Crier tolled his bell loudly to maintain the crowd’s interest and reinforce the appearance of a festivity, rather than a test of the bridge. Will climate agreements and Spain’s (“indivisible”) constitution withstand the tests of time? Are stability principles an enlightened part of creative human design? How well do cosmetic rules of order fair in the long run against the agents and elements of nature? We haven’t even begun our discussion of stability principle applications if we’ve limited our commentary to physical statics and dynamics. The biological realm holds potential for orders of magnitude richer learning. The climate discussion was never about “physics”. It was about human imagination and the structures it thinks (in its most paranoid moments) need to be on paper. What structures on paper can withstand the tests of time? The threat of unity isn’t acknowledged in the designs. Unit minds can flip like a switch (coup or priority change) and with them paper can instantly vanish without trace or resistance. What backup is there with pure unity?? Mature appreciation and understanding of stable division is kept muted. The uniformity assumption does not withstand principled challenge. Stability is a function of principled (not reckless) division. From oldbrew’s above, quote: ” These identified a unique biodynamic feedback phenomena, later called “synchronous lateral footfall,” which resulted in seemingly random walking motions becoming synchronized over time “. This is the same action as seen in the video of cans plus metronomes in the no1 post above. it is the movement of the support that synchronizes whats above it. With humans its easier because they quickly adjust the step. oldbrew – check the video in 1st post. Neither was the support moving there, but once movement is induced in it, it effects all the metronomes. It has becomes the dominating force, tending/forcing to resonance with it. Now that does not exactly replicate what happens on bridge since all metronomes were put to same frequency, and support has no resonant freq itself. Human step is vary varied. But walking on a non-fixed ground disturbs balance until one is forced to synchronize movement with ground. On a gently rolling boat deck you sync with roll; or get quite sea-sick.